New observations from a trio of international telescopes havecaught enigmatic radio-emitting stars called pulsars beaming out signals acrossdifferent octaves, revealing more clues into how these fast-spinning starsgenerate their cosmic lighthouse emissions. Using observations from the new European LOFARtelescope, the Effelsberg telescope in Germany and the Lovell telescope inthe United Kingdom, astronomers were able to observe six different pulsars,each simultaneously across a range of nearly eight octaves. "Not only do such observations give us a fantastichandle on understanding the emission of pulsars, they are also a powerful probeof the interstellar gas that is between us and the pulsar," said studyteam member Ben Stappers of the University of Manchester. Pulsarsare rapidly rotating neutron stars about 12 miles (20 km) across that emitbeams of electromagnetic radiation. They are created when massivestars die and collapse in supernova explosions into compressed objectscomprised solely of neutrons. Since roughly the equivalent of the sun's mass is beingpacked into a tiny space approximately the size of a city, the angular momentumcauses the neutronstar to spin rapidly. In the process, pulsars emit a ray of light thatsweeps around in what has been called a lighthouse effect. If a pulsar is aligned with Earth, its light beam crossesour planet once per rotation, creating a pulse of light visible at regularintervals ranging from a few milliseconds to seconds, depending on the pulsar'smass. Even though scientists have been studying pulsars for thepast 40 years, the exact mechanisms that generate these intense beams of light remainlargely a mystery. Researchers who collaborated on this new study arehoping that will soon change. The team, which included scientists from the Max PlanckInstitute for Radio Astronomy (MPIfR), monitored six different pulsars acrossmultiple wavelengths. The researchers postulated that the emissions seen at thedifferent wavelengths emerge from different heights above the highly magnetizedpulsar surface. By examining the pulsar emissions at various wavelengths,the astronomers were able to monitor the pulsar magnetosphere (or magneticatmosphere) from different altitudes, said study team member Kosmas Lazaridisfrom MPIfR. "We could see the behavior of the particles followingthe magnetic field lines at various heights," Lazaridis told SPACE.com. "We observed that higher up, the magnetic field lines open, and the pulsebroadens." 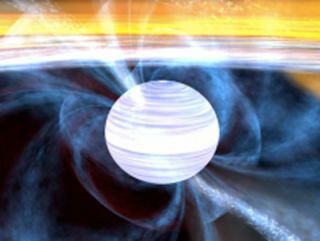 This led the astronomers to suggest that pulsar emissions atdifferent radio wavelengths may be created at different heights above a star'smagnetic poles. The magnetic field lines that accelerate particles spread apartas one moves further and further away from the pulsar's surface. Experimental support for the idea came from observationaldata that found pulses of some pulsars stretching out at longer wavelengths.The shape of the pulsar's emission was seen to evolve quite drastically as afunction of wavelength, and maps the spreading of magnetic field lines abovethe pulsar's magnetic poles. Further study of pulsars will be made even more accessibleonce the LOFAR telescope is fully completed in the next year. This higher sensitivityradio telescope will be able to perform more pulsar experiments, while alsolocating previously-undetected pulsars to study, Lazaridis said. "This telescope represents a new era, and many moreobservations of this kind are to come," he said.